Why is Kurapika so powerful? I know he made ​​a contract with his own soul or something like that. But if this Nen is so powerful, how come he is the only who used it in the series? I also watched the previous version(1999), and there was no one who did this type of contract besides him. Kurapika's scarlet eyes allow him to shift from becoming a Conjurer to a Specialist because of their unique nature. This ability, Emperor Time, allows him to utilize all the types of Nen to 100% efficiency. Kurapika has a Nen blade chain wrapped around his heart. Kurapika imposed a limitation onto this chain, it can only be used to deal with members of the Phantom Troupe. If this condition is violated, Kurapika will die. This condition (a Limitation, a Vow with a punishment) was needed in order to increase the strength of the ability. Kurapika uses vows and limitations. The stronger the vows and limitations are, the stronger the Nen. a student of Nen can increase the overall power of an individual skill by stating a self-imposed restriction that forces even more conditions on it. Kurapika is the one of the only characters shown who uses such strong vows and limitations because of its risk. If he makes one wrong move and attacks somebody who isn't a spider, he will die. For most people, this is a risk that isn't worth taking because they could easily make a mistake - death does not leave any second chanced. Kurapika took on this risk because he was desperate for a way to beat the spiders. On top of this, only being able to use your Nen on a specific group of people, especially one that is only thirteen members, limits the use of your powers substantially. Kurapika's power was one developed exclusively for fighting the spiders but most other Nen users would want to be able to use their power more generally. However, other characters do use weaker versions of vows and limitations. For example, Bomber must tell all his victims about his powers before using it, which means he loses the advantage of anonymity. Combined with his specialist power of Emperor Time, which means he can use all types of Nen with 100% efficiency, Kurapika's Nen becomes very powerful. Emperor Time is very useful because one of the major weaknesses of Nen can be attributed to not being the right 'type'. 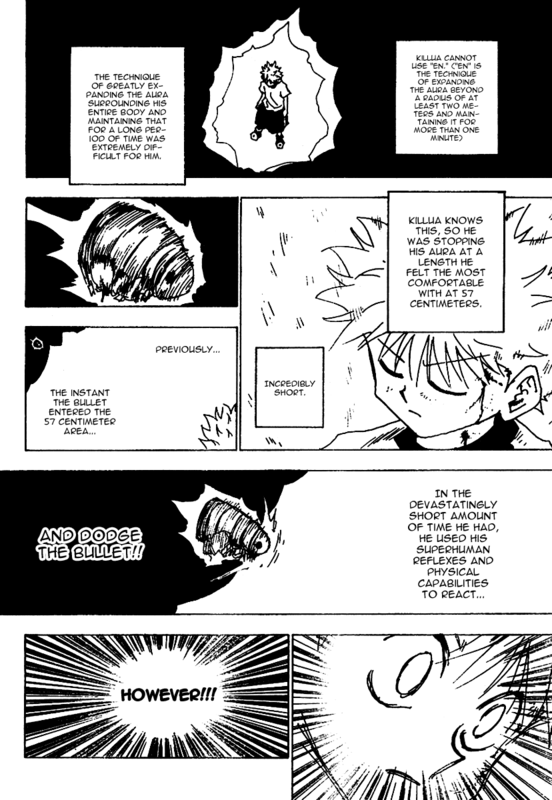 Killua is bad at emitting aura (Chimera Ant arc - Chapter 237 - Page 7) and this is presumably because he is a transmuter. The same with Machi. If the threads leave Machi's fingers, their ultimate strength drops significantly. Enhancers have the advantage of being able to enhance their power. A transmuter only has 40% of this efficiency and so on so forth. Forcibly learning a Nen of a type that doesn't suit you can result in one losing the ability to perform other Nen skills. Hisoka calls this running out of memory. With a combination of these two factors, Kurapika's Nen is far more powerful than most Nen users. It's his Emperor Time, It boosts his Nen Capacity to significant Power Levels. If you put things in perspective, only the Chain Jail is imposed on the spiders and not on everything else. Kurapika himself is above any human coz he's Kuruta and with his eyes he can do everything in a berserk like state. In numbers, Normal Kurapakia Physical Power 100 now add 350 because of emperor time that makes it 450. His got a lets say 250 nen Capacity. Now for Uvon to attack him with a 1000phys+1500nen = 2200 attack power over all, Kurapika has to have the same amount or near that to negate the attack. So Emperor time boosts his Nen output as well, from 250 to 2000. so lets add Kurapikas 450phys+2000nen = 2450 defense power. To simplify and tie in all the other answers. Kurapica's chain jail is the only chain that has a condition and therefore nen boost. Kurapica himself as a kuruta gets a boost in physical abilities when his scarlet eyes turns on. So therefore for Kurapica to negate Uvon's Big Bang impact, he could have had a high boost in Nen as well to augment his over all defense. This is reasonable because Kurapica(for arguments sake) is only a let's say 20 in his regular form while Uvon is a high 100. For a 20 to tank a 100 it should be rational to think that he has a boost in attack and defense because of one hax ability. And from what we've seen, no chain gives him that advantage, it could only have been his scarlet eyes and therefore Emperor Time. Kurapica is powerful because he is a kuruta. Whenever his eyes turn red it boosts his physical and nen capabilities, furthermore change his nature into a specialist instead of a conjurer. His specialist ability(Emperor Time) enables 100% usage of all nen categories without limits, he is actually jack of all trades can master anything based on his characteristics. On the condition part, every nen ability can be enhanced with a condition, how much stricter the condition the more powerful the ability. His chain jail is only applicable to the Spiders, which isn't something you'd want to survive in the HxH world. Good thing for him he's a kuruta with an extremely hax ability. In a recently released chapter (Chapter 364), it's stated that Emperor Time has an additional price: for every second while this ability is activated, Kurapika loses one hour of his lifespan. So, besides the Vows and Limitations of (some of) the chains, Emperor Time was under a powerful vow which boosted its power. Why are the royal guards so powerful? Are the female appearing ants female? Could Alluka completely heal Gon? Why didn't Netero call the more powerful adventurers for help in Chimera Ant arc? Why did Majitani's surrender not count in his Trick Tower fight with Kurapika?